If I’m doing something really wrong with my life, then this post will be gone tomorrow and I will be doomed to rewrite it every single day for the rest of my life. Today, is Groundhog Day, a silly little holiday that got a whole new meaning with the release of “Groundhog Day” in 1993. Just about every person who has brought up today’s holiday has also included some reference to this movie. That is because “Groundhog Day” has officially moved into the spectrum of cinematic classic. When a ten-year-old version of me watched “Groundhog Day” for the first time, little did I know that this Bill Murray comedy would be named by some as one of the best movies ever made, and used by our military as a codeword in Iraq. “Groundhog Day” was not maligned upon its initial release, but it was certainly undervalued. Rarely does a movie such a universally likable quality: movie buffs will admire the model character development, comedy junkies will marvel at Bill Murray’s ingenious deadpan, and those with philosophical minds will admire its attempt to answer age-old quandaries about fate and the possibility of living the same life over and over again. 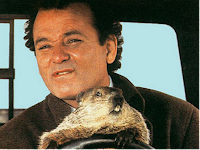 Phil Connors (Murray) didn’t want to spend February 2 in Punxsutawney for the rest of his life (though he eventually learned to think otherwise). However, “Groundhog Day” is a movie I could watch on repeat and still find something new to appreciate, and something old to continue to enjoy. “Groundhog Day” is not something that should be thought about on Groundhog Day alone; it is a movie for everyday and any day of the year. This entry was posted in Bill Murray, Groundhog Day on February 2, 2012 by ian0592.